About 3 months ago when the Southern Hemisphere was entering the dead of winter, I decided that I wanted to grow my own herbs in a container garden. This is not the smartest thing I have ever done and I knew it while I was shopping for seeds, seedlings and soil. I picked plants that I thought were going to survive a few frosty nights. I got coriander seeds (I never have any luck growing cilantro in summer, they just bolt and die so I thought winter might do it some good), garlic chive seeds, rosemary plant, peppermint plant and fennel plant. My strategy has been, largely, to keep my fingers crossed. Rosemary is still alive (really, I can never tell with rosemary if it is going to kick the bucket), the fennel plant has been threatening to die from the start . So far, the mint plant has been the one that's really thriving. The mint kick I have been on lately is largely as a result of this (Exhibit A - Minty Cilantro Chicken Kebabs). Cilantro is doing fairly well too but I am keeping my fingers crossed. I love all the greenery in my balcony and on my plate. These fresh minty falafels would have been quite healthy if I hadn't devoured almost all of it. I am sure you have better self control and discipline than I do! 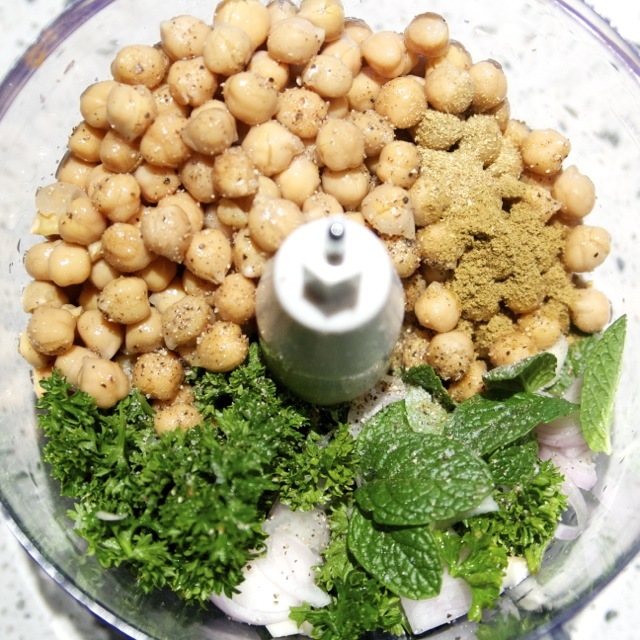 In a food processor, add the chickpeas (drained), parsley, 2 sprigs of mint leaves, shallot, 3 cloves of garlic, cumin and coriander. Season with salt. Blitz it till fairly smooth with a bit of texture. 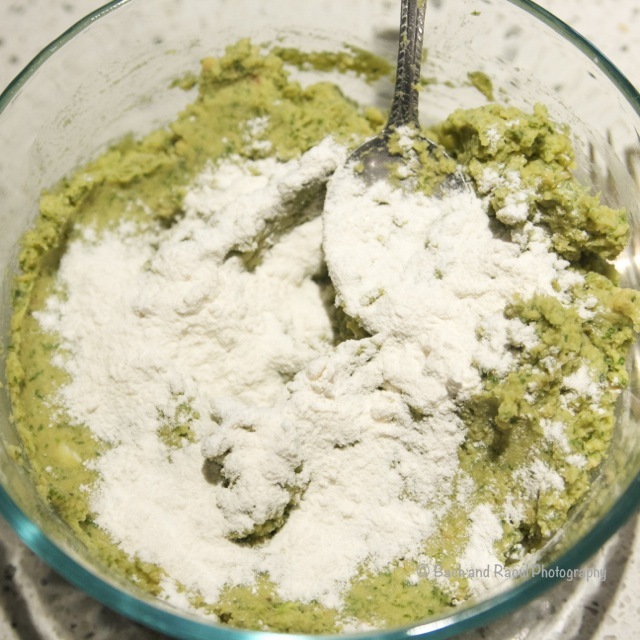 Remove to a mixing bowl and add the flour. Stir it through. Refrigerate this mixture for about an hour. 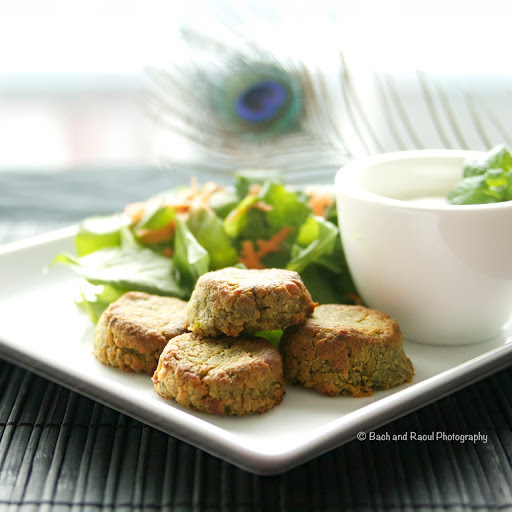 Form into bite sized patties. 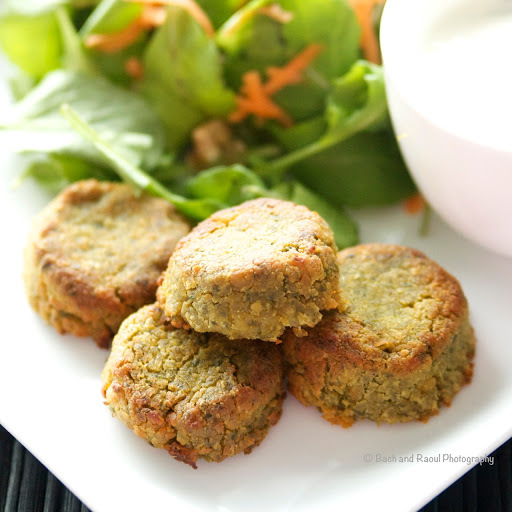 Grease a baking dish with extra virgin olive oil and place the falafel and spray olive oil over them. Bake for 15 minutes in preheated oven at 350 F. Broil for 3-4 minutes. Remove and cool. 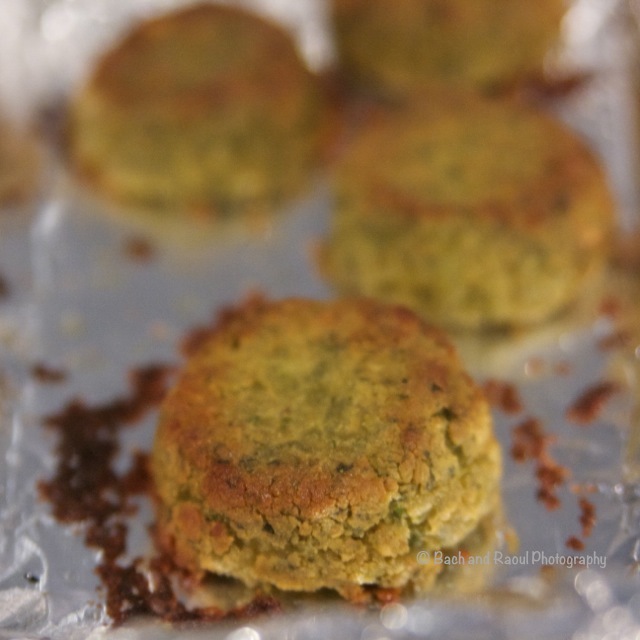 This helps hold the shape of the falafel. 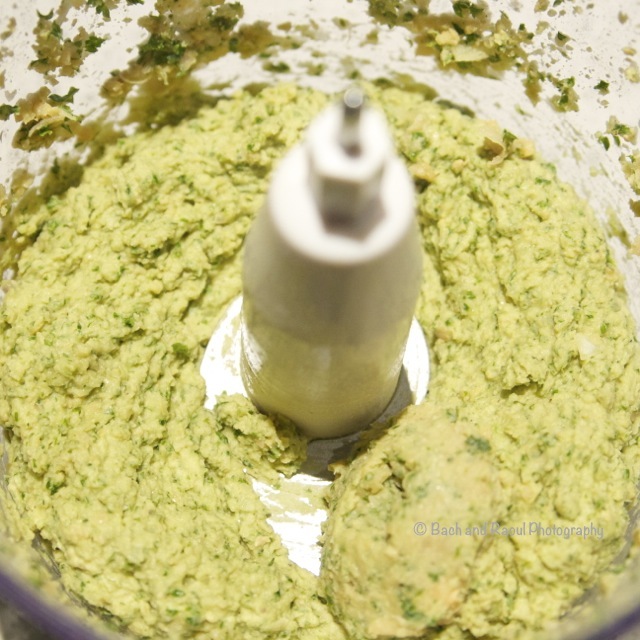 Combine yogurt, one clove of garlic, crushed and the remaining mint leaves. Season with salt and drizzle just a little EVOO. 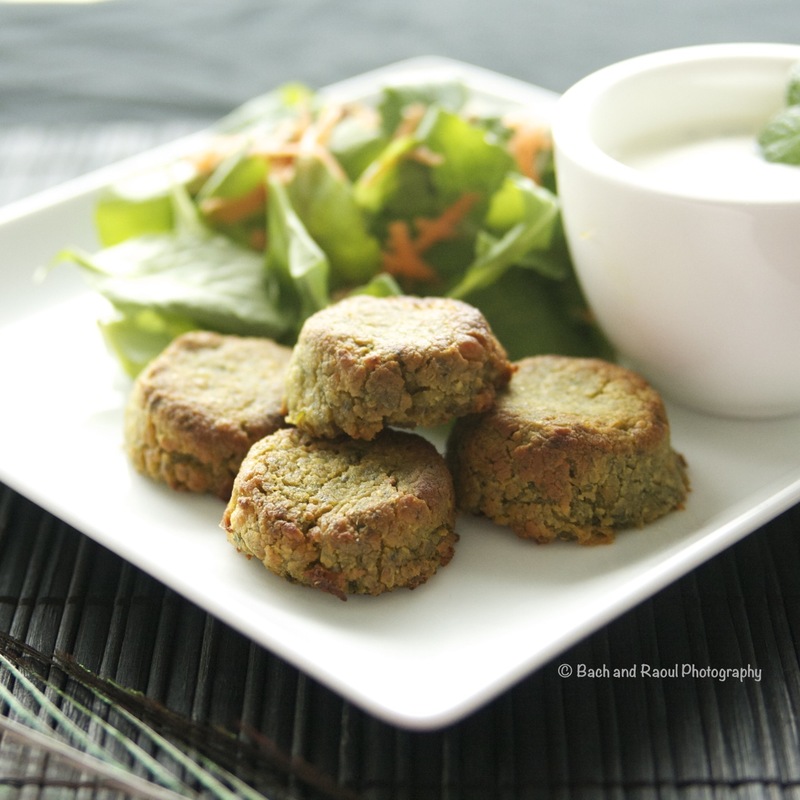 Serve falafel and garlic mint yogurt dip as an appetizer or in a pita bread with salad drizzled with the yogurt dip. 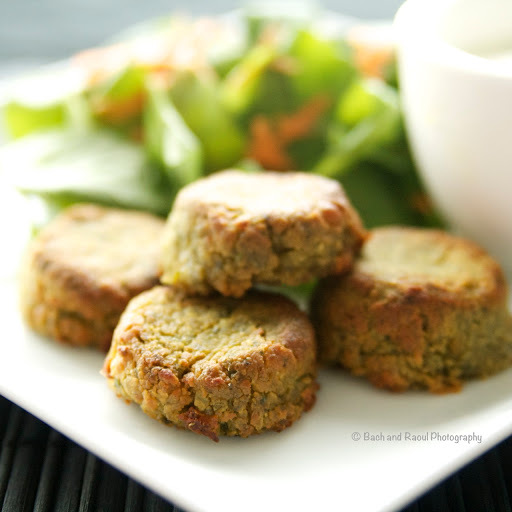 Bach, these falafel look delicious! I love that you baked them instead of frying! And addition of mint sounds so delicious!